Tiny Housers – Innovators or Just Plain Crazy? All kidding aside, the reason tiny housers seem extreme is only because living simply in small spaces has not been the typical dream sold in malls and on television. One would think that those that think outside the norm would be considered thought leaders and innovators… but alas… we’re stuck with the crazy label for now. Luckily more and more people are coming around to the idea that less really is more sustainable (environmentally & economically) and that the oddballs my actually have caught onto something here. A good example of this trend is that Mimi Zeiger is working on her second book on tiny homes. You can find her first book, Tiny Houses , on Amazon. At this very moment she’s busily putting on the finishing touches and oddly enough crazy guys like Deek and I may actually end up on the pages. We’ve both sent off our project photos and have our fingers crossed she doesn’t come to her senses anytime soon. Thanks again Mimi!!! Above are a few photos that you might see in Mimi’s upcoming book. That’s Deek at his tiny cabin in Vermont. You might also want visit his YouTube Channel, and watch the first three episodes of his show called Tiny Yellow House. This entry was posted in Video and tagged Derek Diedricksen, Mimi Zeiger, tiny house, Tiny Yellow House. Yes, we are crazy and loving it! Great pictures of Deek’s cabin, I want one 🙂 If you haven’t gotten his book yet be sure you get his updated one as soon as it comes out. Crazy and inspiring! The problem is simple out of control goverment regulation . time to just say no to the regulators. Try putting a tiny house in Simi Valley (Reagan’s home) sometime. I have a friend who lived there. Trust me, the poor need not apply. Regulation is good when it is controlled by the community. It is not good when, as now, excess liberty allows the powerful few to write or otherwise control regulation to favor their interests over the interests of the community. Excess liberty is what allows this concentration of power. What’s needed is more community, not more liberty. We are at an historical apex for liberty. Now we need to swing back toward the other pole: egalitarianism, and a society that would, for example, demand that all have access to housing. thanks kent, I’ll get you some shots asap. And thanks Michael, as always! Funny you should mention this — I just read an article in “AARP, The Magazine,” titled, “The Leap to Cheap,” by Jeff Yeager, author of “The Ultimate Cheapskat’s Road Map to True Riches” and “The Cheapskate Next Door.” He interviews a number of people who have chosen the simple, smaller life about why the do it. 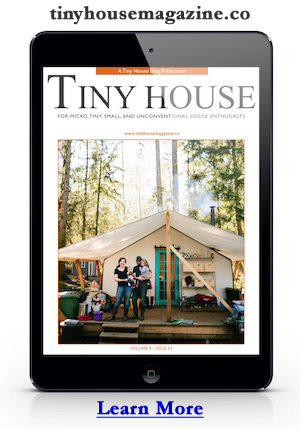 I heard echoes of the Tiny House movement in that article ….